Hey there sports fans! You're a fan of just about every major sport and you have a lot of teams to keep track of. It's a lot to keep straight. The college basketball season is in full swing and if you're lucky, your NFL team of choice is in the playoffs. At UpTo, we know the importance of every free throw, punt and goal—we never want you to miss a game. We have streams for every NFL, NBA, and NHL (here's to hoping!) team, as well as the biggest NCAA basketball teams. All you need to do is head to the Discover screen in UpTo, search by league, city, school or mascot and follow your teams of choice. Just by following a team, every single game is added to your UpTo feed of events. You can see all your teams' schedules right in line with your own, and choose games to add straight to your calendar simply by tapping the plus to join in. 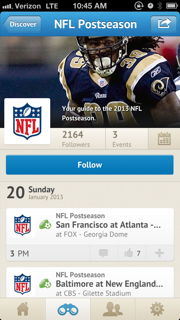 Interact with your fellow sports fans, predict scores and defend your teams honor by posting comments on any event. Can't find your favorite team? Send an email to support@upto.com with a stream suggestion and we will hop to it!